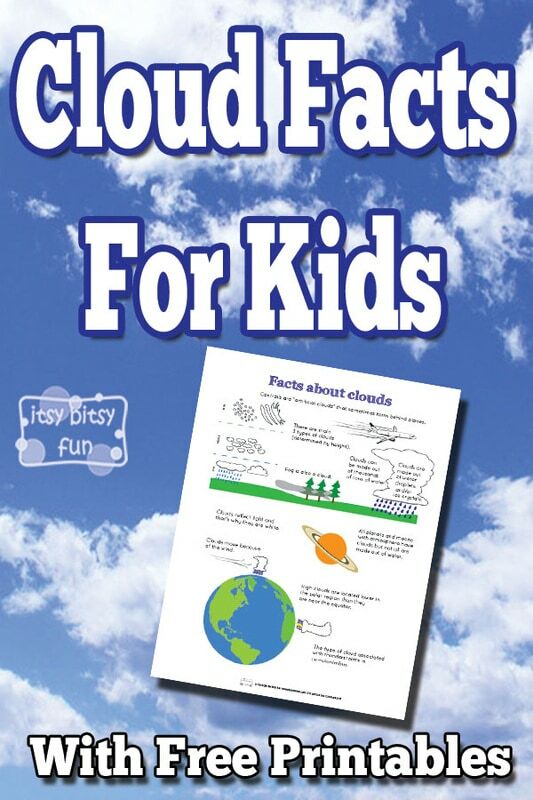 Let’s learn with cloud facts for kids! Learning types of clouds can be pretty tough but learning things about them is way easier! I remember how hard it was for me to learn those types but it took me few seconds to learn that other planets have clouds too and that Jupiter and Saturn have clouds made out of ammonia – I thought that fact was cool and I will probably know it for life. And that’s the point of this page, to share fun facts (which you can also print as a fun “worksheet”) that are easy to remember and add to kids “knowledge base”. Clouds are made out of water droplets and/or ice crystals (plus various chemicals). There are main 3 types of clouds (determined by height). High clouds are located lower in the polar region than they are near the equator. All planets and moons with atmosphere have clouds but not all are made out of water. Clouds move because of the wind. Contrails are “artificial clouds” that sometimes form behind planes. Clouds can be made out of thousands and thousands of tons of water. Fog is also a cloud. Clouds reflect light and that’s why they are white. The type of cloud associated with thunderstorms is cumulonimbus. Get your free printable Cloud Facts here. That’s why I’ve created this fun printable with all the facts illustrated to help kids “learn” them.